Erin Grey Van Oosbree (born August 24, 1973), credited as Grey DeLisle (/dəˈlaɪl/) and Grey Griffin, is an American voice actress and singer-songwriter. She has done voice acting for numerous animated films, television shows, and video games. Her voice roles include Vicky from The Fairly OddParents, Samantha "Sam" Manson from Danny Phantom, Mandy from The Grim Adventures of Billy & Mandy, Frankie Foster, Duchess, and Goo from Foster's Home for Imaginary Friends, Yumi Yoshimura from Hi Hi Puffy AmiYumi, Azula from Avatar: The Last Airbender, Kimiko Tohomiko from Xiaolin Showdown, as well as Lola, Lana, and Lily Loud from The Loud House, Queen Butterfly and Jackie Lynn Thomas from Star vs. the Forces of Evil, Vambre Warrior from Mighty Magiswords, and Prince Puppycorn from Unikitty!. She has been the voice of Daphne Blake in the Scooby-Doo cartoons and direct-to-videos and other appearances since 2000. In video games, she voices characters such as Amanda Valenciano Libre from Metal Gear Solid: Peace Walker and Jacqueline Natla in both Tomb Raider games; Anniversary and Underworld. On September 27, 2018, Griffin released her debut comedy act, titled, "My First Comedy Special". DeLisle was born in Fort Ord, California, to truck driver George Van Oosbree and singer Joanna Ruth. Her parents separated when she was young. She has one younger brother. DeLisle's mother became a born-again Pentecostal when she was eleven and she was later raised by her maternal grandmother, Eva Flores, a vocalist who performed with salsa musician Tito Puente. She credits her father's love of country music as the biggest influence on her musical taste. She attended Chula Vista High School in the same graduating class as Mario Lopez. In her late teens, she started singing old gospel tunes, and entered the world of comedy on the advice of a friend. In her comedy routine, DeLisle imitated voices. Her impressions earned the attention of a casting director and was advised to take up voice acting. At this time, she went back to her musical ambitions but also took classes in voice-overs. She soon began working with talent agent Sandy Schnarr. In the Scooby-Doo franchise, DeLisle has voiced Daphne Blake since the direct-to-video movie Scooby-Doo and the Cyber Chase, which she inherited from her friend and teacher Mary Kay Bergman following the latter's suicide. She later said of Bergman: "It was an interesting turn of events to get to play Daphne, but I'm so glad that I have the role, and I was glad that I was able to carry that on for her. She set the bar very high." DeLisle also credited the work for helping her maintain her music career, stating "I think Daphne just saved country music". Her first marriage was to Christopher DeLisle in 1992. The two later divorced in 1993. In 2002, she married Murry Hammond of the country band Old 97's; their courtship and wedding were featured in an episode of A Wedding Story. She gave birth to their son Jefferson Texas "Tex" Hammond in 2007. They divorced in 2010. She later met Jared Griffin through Twitter, and they married on June 27, 2012. Their son Harlan was born in 2014. Griffin gave birth to her third child in 2016, a daughter named Mariposa. The two separated the following year. ^ a b c d e Leggett, Steve. "Grey DeLisle". AllMusic. Retrieved May 10, 2007. ^ @greydelisle (September 10, 2018). "Come see the world premiere of MY FIRST COMEDY SPECIAL! @henlips @EliBraden FREE SNACK BAR/Q&A! Reply to get on the guest list" (Tweet). Retrieved February 23, 2019 – via Twitter. ^ "Grey DeLisle Bio". CMT. August 24, 1973. Retrieved September 2, 2013. ^ DeLisle, Grey. "Me, mom, and baby brother!". Instagram. Retrieved May 13, 2014. ^ a b "You're the Voice: Grey DeLisle". popdose.com. Retrieved March 22, 2015. ^ House, Silas. "Grey DeLisle – A remembrance of things past " Americana and Roots Music - No Depression". No Depression. Archived from the original on October 20, 2012. Retrieved September 2, 2013. ^ "You're the Voice: Grey DeLisle". August 28, 2010. ^ Barton, David (April 30, 2001). "Grey DeLisle - Immaculate Imperfection". No Depression. Retrieved September 10, 2013. ^ "For those of you who need to catch up". Old 97's. September 15, 2002. Archived from the original on November 27, 2010. Retrieved March 1, 2017. ^ Ciccarelli, Stephanie (February 8, 2007). "Vox Talk #12 – Voicey Judges, Superman Brandon Routh, Bettye Zoller, Grey DeLisle Gives Birth to Baby Boy". Voices.com. Retrieved January 23, 2017. ^ @greydelisle (July 12, 2012). "I married my Twitter crush, @Rob_Zincone, 2 weeks ago!!! Thank God for social networking!!!" (Tweet). Retrieved January 23, 2017 – via Twitter. ^ "Tara Strong / Grey DeLisle @ AFO 2012". YouTube. Retrieved January 4, 2013. ^ @GreyDeLisle (August 7, 2014). "Harlan Roy Griffin was born 8/7/14. (He wasn't due until October!) He's tiny, healthy, and adorable!" (Tweet). Retrieved January 23, 2017 – via Twitter. ^ @greydelisle (December 17, 2016). "Welcomed our baby daughter into the world today! Mariposa "Posie" Ruth Griffin! 7lbs 6oz,20 inches long. So in love with this little lady!!!" (Tweet). Retrieved January 23, 2017 – via Twitter. ^ @greydelisle (April 12, 2019). "Can someone with an active @Wikipedia account please change my marital status to single since 2017? I'm trying to convince my boyfriend's parents I'm not married" (Tweet). Retrieved April 13, 2019 – via Twitter. 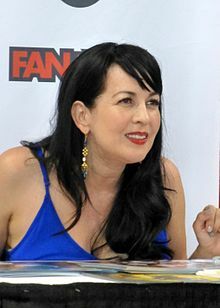 Wikimedia Commons has media related to Grey DeLisle. ^ "Twitter". mobile.twitter.com. Retrieved April 13, 2019.